Last week's raid may have been the best thing that could have happened to the Occupy Movement. Occupy Oakland is stronger than ever. By the time Michael Moore — liberal icon, acclaimed documentary filmmaker, and bearer of some 915,000-and-counting Twitter followers — came to speak to Occupy Oakland last Friday, the writing was already on the wall. This was, after all, a full three days after police had raided the hundred-plus-tent city; after downtown Oakland had erupted into a heated standoff between cops and protesters that lasted well into the night and resulted in more than a hundred arrests and untold injuries; and after what happened in Oakland had spread around the world via Twitter, Facebook, and the mainstream and alternative media. "We've been watching," Moore said about fifteen minutes into his speech to the crowd of hundreds that had gathered in Frank Ogawa Plaza in the late-afternoon sun. "Millions have watched it. And millions have been inspired by you because the next night, you didn't go away! You came back!" The audience erupted into combustible cheers. Moore was one of many thought leaders, progressives, and pundits who took Oakland on as a cause after last week's raid and subsequent clash with police. Jon Stewart, Keith Olbermann, and Rachel Maddow devoted segments of their respective TV shows — with varying degrees of subtlety — to questioning Mayor Jean Quan and the city's actions. Foreign press like Al-Jazeera and the Guardian (UK) covered the events as they unfolded, and typically apolitical websites like Gawker and The Awl published long, opinionated pieces on the occupation, the city's response, and what it all meant for both the individuals involved and the movement at large. Literally all around the world, protesters marched in solidarity with Oakland: in Chicago and Atlanta, in Philadelphia and New York, and as far away as Cairo, the events in Oakland appeared to have reinvigorated support for other local branches of the larger movement. In Lower Manhattan, where the Occupy Movement began six weeks ago, hundreds of protesters walked the streets chanting "Oakland is New York; New York is Oakland." The New York camp also donated $20,000 and a hundred tents to Oakland in the wake of the raid. In Tahrir Square, recently the site of Egypt's own uprising, protesters held handmade signs that bore slogans supporting Occupy Oakland and heralding a shared cause of "social justice for all." And in San Francisco, police called off a planned raid on the city's encampment at Justin Herman Plaza on Thursday; the San Francisco Police Department's official explanation was that it was worried that protesters from Oakland would cross the bay and cause trouble, but speculation swirled that Mayor Ed Lee, who's currently embroiled in a mayoral race of his own, had been scared off by the reaction to Quan's crackdown. And back here in Oakland, less than 24 hours after Tuesday's confrontation, thousands of people clogged Frank Ogawa Plaza — more, it appeared, than had ever come to the group's meetings before. At press time, the encampment looked to be about as robust as it had been a week ago, and members of Occupy Oakland have spoken both publicly and privately about how the group has been emboldened by fresh blood and newfound international support. At the same time, Quan, facing tremendous criticism from the press and from her progressive allies, has few choices: She can let the encampment remain and do her best to make sure it's clean and safe, or undertake another climactic action and risk further alienation and unrest as all eyes remain on Oakland. Occupy Oakland also is now strengthened because of the crackdown last week. As E.D. Kain of Forbes wrote the day after the raid, Quan and city officials did exactly what you shouldn't do: "If you want a protest or a rally to dissipate, ignore it. Until it turns into a violent riot, ignore it. Even if it goes on for weeks and months, eventually people go home. If you want to make the protests more poignant, more profound, if you want to swell the ranks of the protesters and give them even more legitimacy, attack them with tear gas and flashbombs. Arrest them en masse." In other words, what happened on October 25 has empowered Occupy both here and afar, and on both a literal and symbolic level. For occupiers and their allies, it's a perfect narrative: Oakland, which has always held a unique position in the collective imagination, makes for a compelling metaphor for the scourges of poverty, police brutality, and gentrification, and individuals like Scott Olsen — an Iraq War veteran who made it through two tours unharmed only to be seriously injured twenty miles from his own home — and the unnamed, wheelchair-bound protester — whose silhouette, engulfed in smoke and gas, was tweeted thousands of times — are emblems of a nation racked by inequity and misplaced priorities. 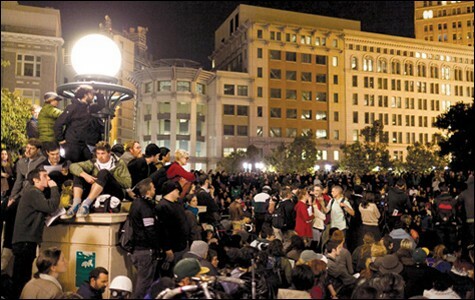 Whereas Occupy Oakland, and specifically the conditions at Frank Ogawa Plaza, had previously been a magnet for right-wing antagonism, mixed local opinion, and public health and safety concerns from city administrators, what happened on Tuesday turned protesters into sympathetic victims and the camp into a cause larger than itself. And where the Occupy movement at large has been widely criticized for being too abstract, too diffuse, and too inchoate, Oakland — and the story of Scott Olsen, and the iconic images of teargas flooding the streets of downtown, both of which spread worldwide in a matter of hours over the Internet — presented something concrete to latch onto. 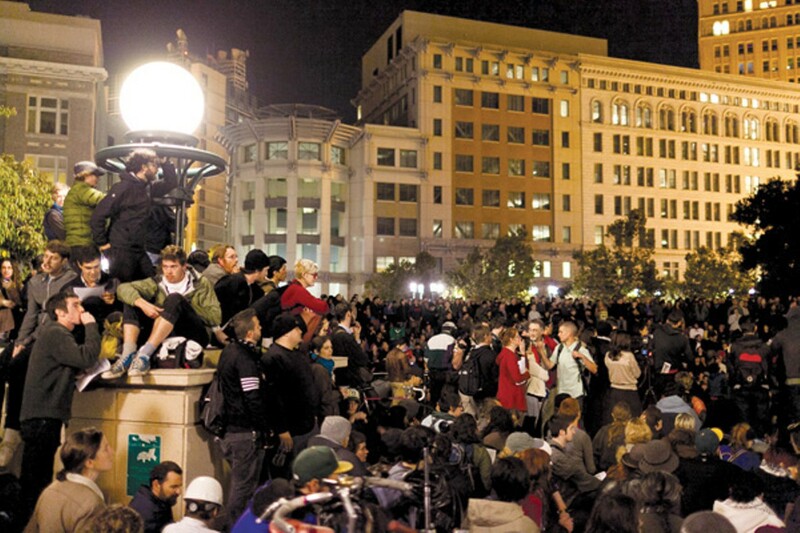 In that sense, last Tuesday's raid and protests may have been the best thing that could have happened to the movement — which is ironic, not least of all because, according to sources within city hall, the original raid on Occupy Oakland was motivated in part by Quan's concern that deteriorating conditions at the site might delegitimize the movement at large. In trying to protect Occupy, Quan gave it its first, biggest, and highest-profile challenge from above, which in turn imbued the movement with more power than it had before. The whole world really is watching now.